Your course content should be designed for all types of users. This includes students with disabilities, and also students with different learning styles and in non-classroom environment. For a online, self-directed primer on Universal Course Design, login to D2L and look under Self Registration (menu near the top, on the right). Students with visual, motor, or learning impairments may have a difficult time with assessments that have a time limit. One way to mitigate this issue is to extend the time limit to make it more flexible for specific students. 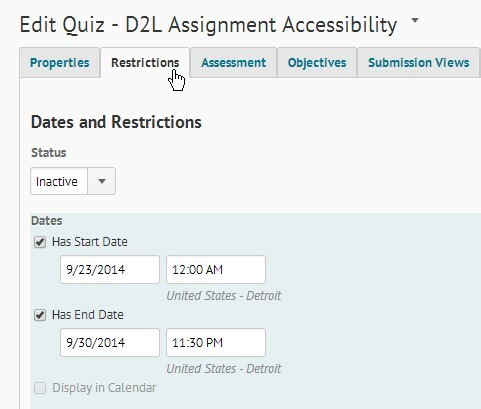 If a time limit is essential to the assessment, try to accommodate students that may need an extended time limit, and inform them that they may request this time extension for D2L quizzes. 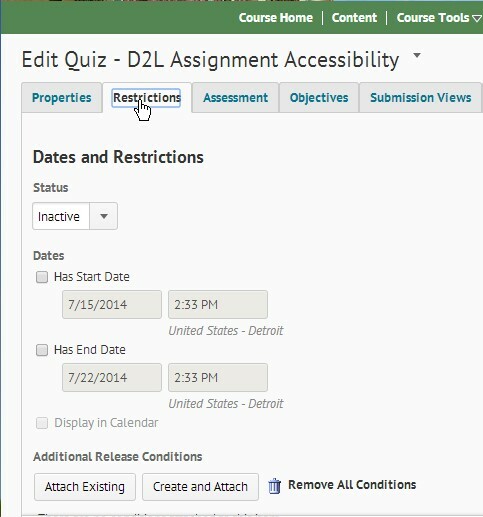 To extend the time limit of an assessment, click the drop down arrow next to a quiz, then click the Edit button. Then click the Restrictions tab. Next, scroll down to the Advanced Availability section, ensure the Allow selected users special access to this quiz option is enabled, and click Add Users to Special Access. Here you will be able to change the start date, end date, time limit, grace period and late submission requirements for specific students in your course that have requested special access through the Resource Center for Persons with Disabilities (RCPD). 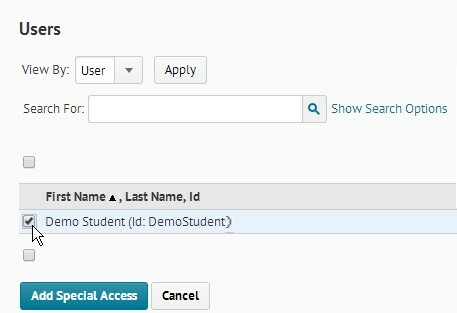 To enable special access conditions for specific students, click the checkbox next to any users that require special access conditions. Once you have selected the appropriate students click Add Special Access to save your changes. You can allow special access to specific students with the dropbox tool as well. Follow the same process: Click on the dropbox, scroll down to the Advanced Availability section of the Restrictions tab, and click Add Users to Special Access. Here you will be able to change the start date, end date, time limit, grace period and late submission for specific students in your course that have requested special access through the RCPD. Scroll down to the Timing section, and extend the time limit to the necessary level. 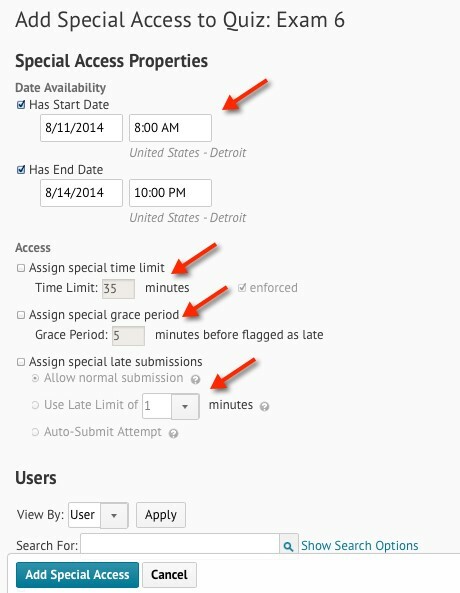 You can change the time limit and grace period for all students in your course as well. If the course material does not require a strict time limit, ensure the deadline or limit is long enough for those with impairments. You should always provide readings, assignments, and any other class material well in advance of their deadlines. This will give the students time to work ahead and prepare responses. 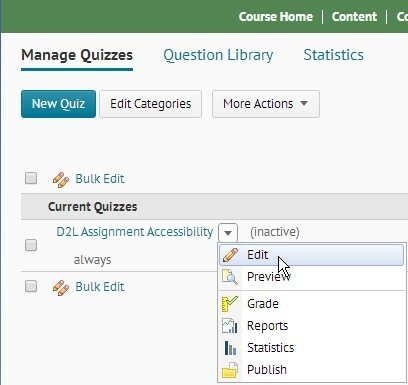 To make sure that you are adding accessible documents to your D2L course, be sure to follow the software specific tutorials on the webaccess.msu.edu website. 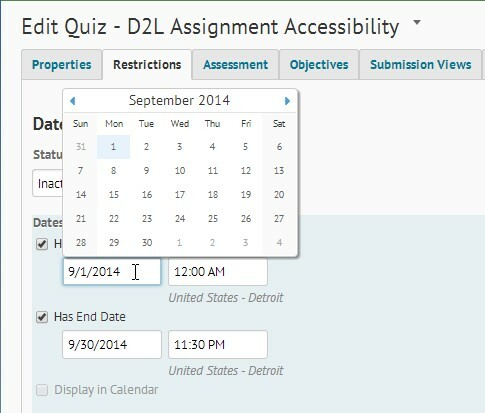 To enable earlier access to D2L assessments, click on the Restrictions tab when creating or editing an assessment. 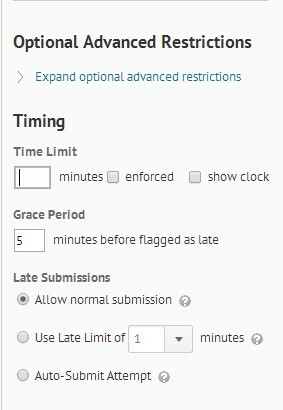 Then click the checkboxes next to Start/End dates to enable deadlines. Click the date next to either one to edit deadlines. Ensure you give students access to assessments well in advance of their deadline. When using communication tools, it is recommended to use the Discussion tool rather than the instant messaging tool. Instant messaging tools can be difficult to those with impairments, as they require quick processing and respond time to information which some students may find impossible. Discussion forms give the users more time to process, reflect, and respond to information that has been provided. If instant messaging is necessary, be aware that those with impairments may require alternate methods of communication to participate in the conversation. To help engage students, offer course materials in a variety of formats: audio, video, and text alternatives should be available. Though it can seem redundant at times, applying various formats to course materials can reinforce concepts and ensure that those with impairments have equivalent access to the content. Alternate formats that are provided must be made appropriately accessible. Setup discussions that encourage peer-to-peer support. In quizzes, use the vertical layout so that only one question appears per page.